Do You Really Understand What’s Happening in Oil Right Now? 2017 had the largest reduction in global oil inventories since data became available 33 years ago according to data driven firm Cornerstone Analytics. Stop for a moment and think about what that means. If inventories are declining, that means that daily global oil consumption is exceeding daily global supply. It really is as simple as that. And based on Cornerstone Analytics inventory decline data, that daily supply shortage experienced in 2017 is the largest in recorded history. That would include the disturbingly tight oil market of 2007 and early 2008 that sent oil prices shooting towards $150 per barrel. 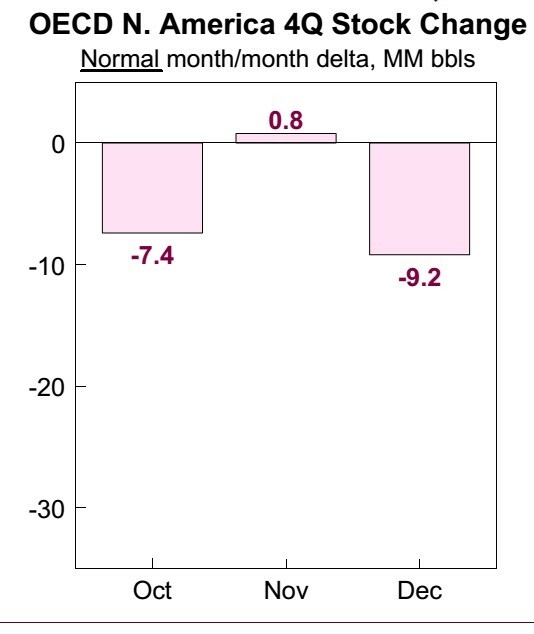 The chart shows that Q4 normally sees an inventory reduction of 15.8 million barrels. Got it? Now you need to get a load of what 2017 looks like. 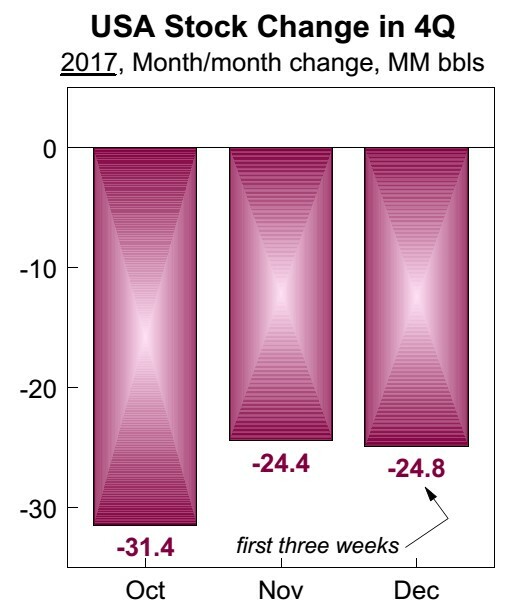 In 2017 the decrease (with one week of data remaining) was 80.6 million barrels…..vs the normal 15.8 million decrease. We have had the equivalent of five years’ worth of Q4 inventory draws in this year alone. These numbers don’t require much explanation on my part. The numbers are extremely bullish for oil prices. I think that 2018 looks even more bullish. Think about it….here we are with inventories already shrinking extremely fast and the massive post oil crash capital spending cutbacks really just starting to impact production. Remember, global energy research company Wood Mackenzie has estimated that those cutbacks exceed $1 trillion. 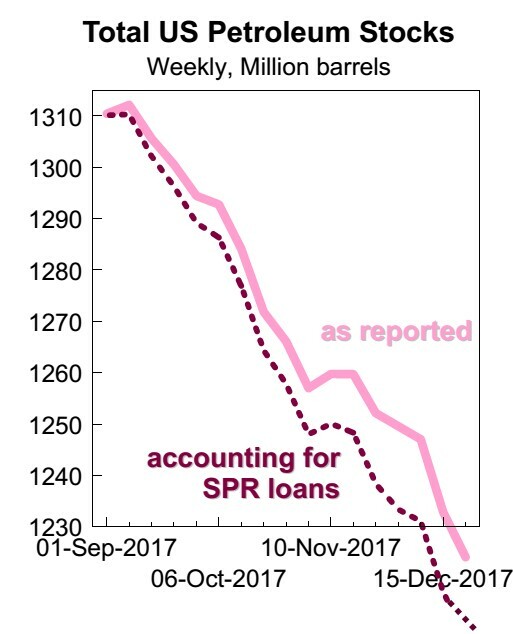 We have had large mega projects (offshore and oil sands) that were sanctioned before oil prices crashed coming on-stream over the past couple of years. That pool of new sources of oil production is about to dry up completely. Spending on mega-projects has been shelved. Well it isn’t rocket science this time around. Oil prices have moved but they are still only $60 per barrel…..so they have lots of room to run. Meanwhile the stock prices of oil producers that have been beaten down for years have hardly moved. The stock market has been slow to believe what the oil market is telling it. Now is the time to take advantage of this next up-cycle that is shaping up. The best oil stocks are still remarkably cheap. Sticking with best-of-breed companies has always worked for me—and my subscribers. I can’t believe this company—with very low debt and best-in-class assets—still has a rock bottom valuation. And management has built and sold THREE junior producers before for huge shareholder wins. Right now is the time to get positioned to profit from this rapidly tightening oil market and this is the company through which to do it. 2018 is going to be the year that the oil bull roars again. To start making money from it, get the name and symbol of this stock by clicking HERE. Previous post: This Entire Industry is Running Off a Cliff–Why?